Thread: Are these 160mm to 180mm post adapters safe to use? I'm facing a problem that seems to be rather familiar: I have Avid BBDB Type N (basically BB7) brakes on a post mount fork and I want to switch the front rotor from 160mm to 180mm. Avid's rotors and adapters are 185mm but for some reason they are way more expensive than all the other brands out there, so that's why I'm looking at 180mm. I've read that one option is to get a 185mm adapter and shave it down. 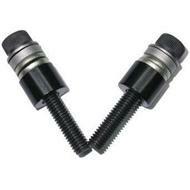 Another is to use another manufacturer's 180mm adapters. A third option which I think works only for IS mounts is to use a 160mm rear adapter on the front to achieve 180mm spacing. That brace between the two bolts holes isn't just there for show, it's there to brace the mounting bolts against lateral forces which could try to shear or bend the bolts. Which leads me to wonder, why would ComCycle even sell an adapter when it seems like it is much weaker? A related question: would this adapter work with with Avid brake calipers? Last edited by derailin_palin; 11-11-2009 at 03:09 PM. It looks good to me, too, but will it actually fit an Avid BB7 or BBDB-N caliper without any clearance issues? I've used all 3 adapters, the first work ok, but you might have to file some material down. You can see the 2 below have different heights for each screw. Also, what rotors are you running? The 7" from Avis are 185's and Shimano/Hayes/... use 180. So, you might have to use a washer or 2 to get the right height. I know it has been a while since this post was active, but I have a question about these adapters. I just purchased a 2013 Stump Jumper FSR Comp 29. The front rotor is 180mm with the post adapters seen in the first picture. I am getting a wobble in the front tire only while braking with the front brake. The wheel and rotor both appear to be true. Is it possible that those adapters are the reason for the wobble ( not stiff enough ), and I should look at purchasing one of the post adapters seen in the second photo to give more support while braking? Or is it just the characteristics of the Avid brakes? I am around 220 with all my gear on. "Ideal bikes are not bought, they evolve beneath you"
I up-sized rotors on my hard tail and full suspension with good results. If you are using the OEM stock set up, from reputable supplier and LBS, you should be good. But worth your time to take the bike by LBS and ask them to check out the torque on your calipers mounting Allen-head bolts and the six rotor mounting Torx screws.